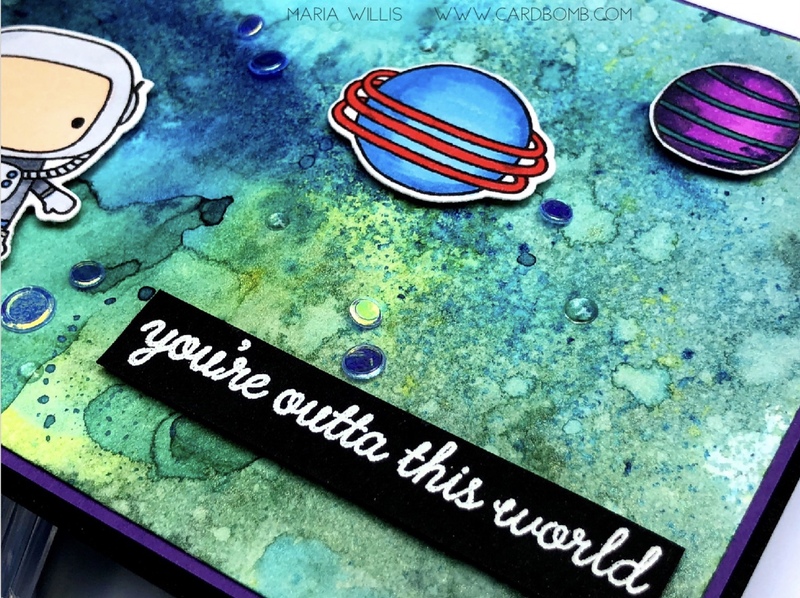 Cardbomb: Moon Men- You're Outta This World! Hey Everybody! It's been a while since I've posted and I'm sorry for being a bit MIA. A lot has been going on in the last couple of weeks. I've been trying to knock things off of my "to-do" list and I've been running around like a chicken with my head cut-off. The end of "things to do" isn't really in sight but I'm so glad to have the time to say hi to you guys today. I have been crafting but haven't had time to photograph and blog much so I'm sorry I haven't been sharing here. 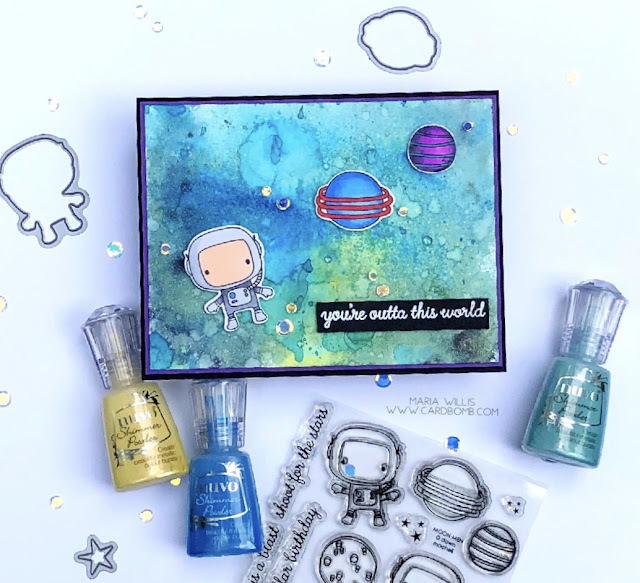 Anyhow, on to today's card because I'm sure that's why you are here... And, I absolutely LOVE what you can do with the Nuvo Shimmer Powders that I used on this card! It was my first time using them and they are easy to use and you can get such a variety of gorgeous effects with them (video coming soon!). The shimmer powders made the perfect, magical background for the astronaut and planets from Reverse Confetti's Moon Men stamp set. I'll put a link to the Nuvo Shimmer Powders at the bottom of my post in case you'd like to pick them up for yourself. Here's a close up of the background. 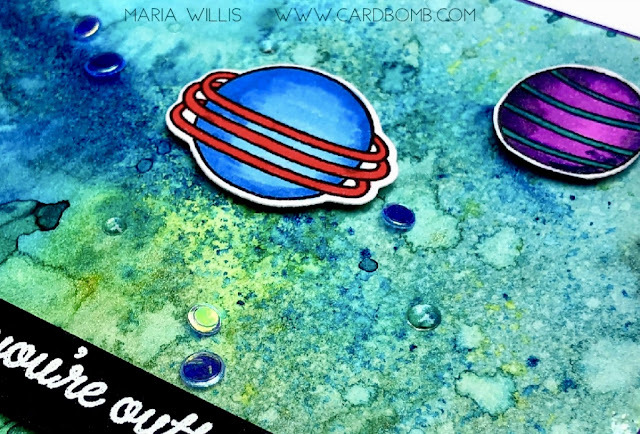 I started with a piece of watercolor paper and used just three colors of shimmer powder to create this background. I started out by tapping out some of the powder onto the dry paper and then I spritzed it until I saw the powder activating. Depending on how much water is on your paper you can tilt it back and forth to mix the colors, or, you can use a paint brush to drag them around to where you want them. I colored my Moon Man and the planets with Copic Markers. I wish I could remember what colors I used... but I made this a few weeks ago and didn't make note of what I colored with before cleaning up my desk. 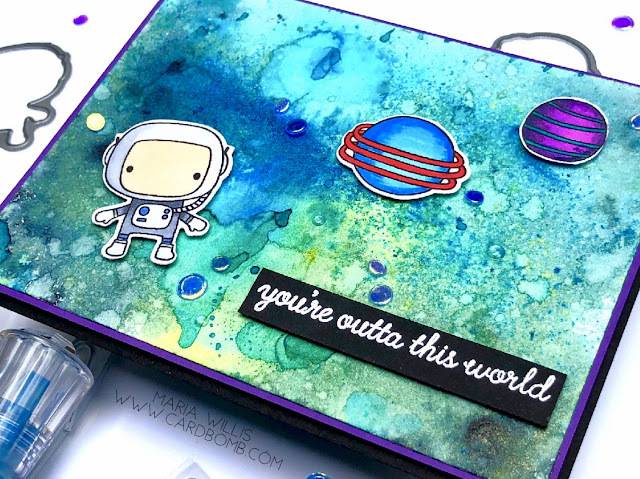 If you look closely at the purple planet you can see that I also added a little bit of the black shimmer powder to add some shading. It looks cool in real life bc it glitters when you move it. I heat embossed my sentiment in white added it to the card with foam adhesive. 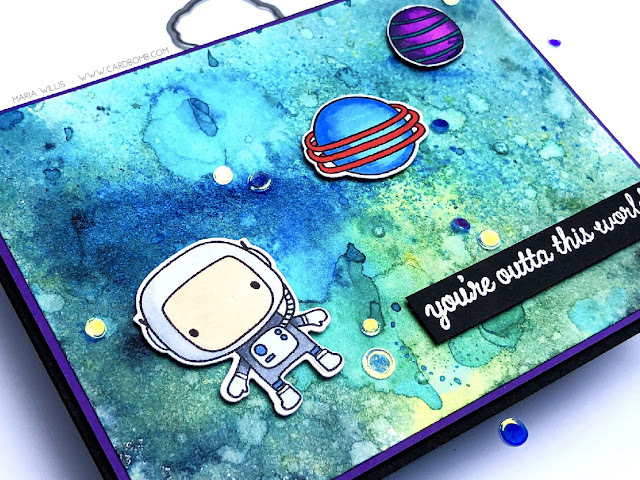 I used some awesome Crystal Clear Confetti sequins by Studio Katia to finish off the card. These sequins have a gorgeous iridescent look and have no hole in the middle which I love! It makes them so easy to adhere as you don't have to worry about glue seeping out the hole in the center. That's it for today you guys! I'm so glad to be back here. I hope you all have an amazing day today and I will be back soon (really, I promise, lol!)! Thank you Barbara! I really had fun with the background! Perfect background for those space images.